We start with a center body made from 6061-T651 aircraft grade Aluminum hex to replace the flimsy non-adjustable OEM spaghetti links. We then add super strong 6,000 lbs radial load capacity sealed ball joints on either end to provide many years of noise free operation. Our ball joints have a built in dust boots to seal out the elements and do not require any maintenance. If they ever do need to be replaced, they can bought seperately on our site. These linkages will not deflect under the hardest track corners and will provide the most accurate handling. GruvenParts Billet R32/TT Adjustable Rear Swaybar Endlinks ! Got a lowered TT MK1 or R32 MKIV ? Then you need to be able to adjust your rear stabilizer bar end links to ensure the linkages ride perpendicular to the sway bar and correct the less than ideal handling typical of lowered set ups. The factory set up does not provide any adjustability in the sway bar end links but GruvenParts.com has you covered! We’re proud to release these adjustable rear stabilizer bar end links with FORGED high strength steel lower bushing ends with rolled (not cut!) threads, and high strength fully sealed upper tie rod ends. The center bodies are custom machined from STAINLESS hex in house and then powder coated beautiful gloss black or Bilstein jazz blue to match our Adjustable Rear Control Arms and our Adjustable Front Sway Bar End Links. These come ready to install and are pre-greased with special polyurethane grease and include a new lock nut on the top joint. Please re-use your existing lower OEM bolt when installing these adjustable units. These are sold in sets of 2, enough for 1 vehicle. This product fits Audi TT (2001-2006), Audi A3/S3, VW MKIV R32 (2004), Golf 4motion and 4motion Variant, VW Bora 4motion and 4motion Variant and replaces OEM linkage P/N 1J0505466B. 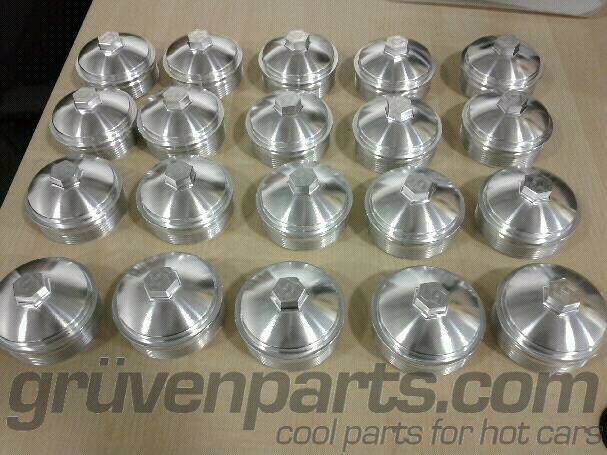 Billet VW/Audi 1.8T Billet Coolant Head Flanges -- NOW IN STOCK ! 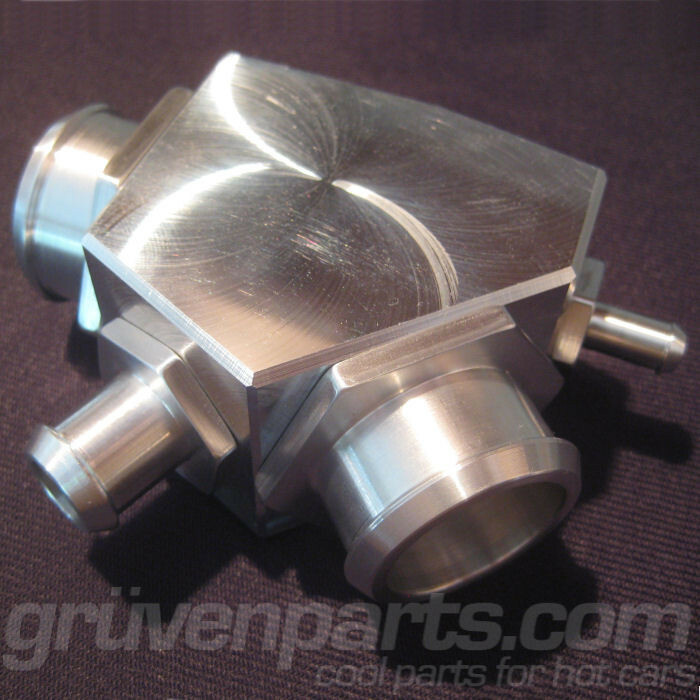 GruvenParts.com is happy to release these VW/Audi Billet 1.8T Coolant Head Flanges made from 6061-T651 aluminum and professionally tig welded and 100% pressure tested. This billet aluminum version replaces the crack prone plastic 1.8T head coolant flange P/N 06A-121-132-AP, and is also interchangeable with 06A-121-133-BB, 06A-121-133-J, 06A-121-132-D, 06A-121-132-G, 06A-121-132-Q. (06A121132AP, 06A121133BB, 06A121133J, 06A121132D, 06A121132G, 06A121132Q). This part fits all 2000-2006 Audi TT w/1.8T engine and all 2000-2007 VW Golf/Jetta/337/20AE/GLI with 1.8T engine. This part is machined in house like everything else we make (not in China) using one of our 4 axis CNC HAAS milling centers. This part ships with a new Viton base O-ring preinstalled. Just add your coolant temp sensor and bolt it up! We're so sure this will eliminate your crack prone head flange, this part comes with a LIFETIME WARRANTY. Options for this part include deleting the heater core outlet, oil cooler outlet, or both. And dont forget to also check out our popular billet 1.8T upper radiator hose 4Y and the billet 3Y. Billet 1.8T / 1.9TDI / 2.0 Upper Radiator Hose 4Y! GruvenParts.com is pleased to announce the release of our MKIV VW Golf/Jetta 1.8T and Audi TT MK1 1.8T Billet Y Pipe made from aircraft grade stainless steel to replace the cheap plastic OEM fitting found on hose P/N 1J0-122-109AQ (1J0122109AQ). Billet VR6 Crack Pipes for ALL VR6 Engines Corrado thru R32! MACHINED FROM 6061-T651 ALUMINUM TO EXACTLY MATCH OEM PIPE DIMENSIONS - OURS DOES NOT COME WITH CHEAP THIN WALLED TAPPED FITTINGS LIKE OTHER LESSER PIPES !! GruvenParts.com was the 1st to build this part and it’s what started us off! We manufacture this pipe EXACTLY to match the OEM part shape so there is NEVER a fitment issue. Be careful when considering other billet pipes which do not match the exact shape of the OEM pipe. The fitment of this part is tricky and the shape MUST BE IDENTICAL to the OEM part to ensure correct alignment between the water pump and thermo housing. If you have a billet crack pipe in your VR6, chances are it was made by us. Hand crafted in our Aerospace shop using O-rings from the Boeing 777, proven by many hours of track time, it's the highest quality crack pipe you can buy. It's on all of our track cars and has withstood countless hours of track abuse! Our pipe has a modular design which allows you to plug the oil cooler feed line with a ¼ NPT plug if installing an external oil cooler. Ours can also be ordered with a chrome plated drain valve for quick and clean coolant flushes. The pipe can also be ordered with a brilliant chrome finish for those seeking the ultimate engine bay bling! If you dont want to do this job again, buy the LIFETIME WARRANTED GruvenParts.com billet CrackPipe ! The 12V version replaces OEM p/n 021-121-050C (021121050C) found in 12V VR6 : VW Corrado, Golf, Jetta, Passat, and Eurovan. Billet VW/Audi 4.2L V8 Oil Filter Housings ! Special Pricing in Effect ! Precision Machined Aluminum Oil Filter Housings For VW And Audi 4.2L V8 Engines ! GruvenParts.com now has these billet aluminum oil filter housing covers for VW and Audi 4.2L V8 to replace OEM part number 077-115-433B (077115433B). The OEM plastic oil filter housing cover is not very durable and often strips out making it impossible to remove the oil filter. The engine flange which this cover screws into costs over $1,000 and is easily broken while trying to remove a stripped filter housing cover. We have put an end to this nonsense ! The GruvenParts billet aluminum oil filter housing cover is made from a massive chunk of Aircraft Grade 6061-T6511 Aluminum. The section is delicately placed onto one of our special CNC machining centers and precision cut to EXACTLY match the OEM plastic housing. The metal gods (well, in this case, one of our highly talented CNC programmers) has programmed elaborate steps for the very time consuming and expensive operation of profiling the special buttress threads into the housing using the exact DIN spec thread cutting tool required for a perfect seal. It simply doesn’t get better than this! We also provide USEABLE 24mm hex flats so you can easily remove the housing with a standard 24mm socket. This could possibly make changing your oil fun again! May fit other vehicles as well, please check to see if your vehicle uses OEM part number 077-115-433B (077115433B) oil filter housing cover. This housing uses the standard OEM filter, P/N 079-198-405A (079198405A). You can order the billet housing with or without the filter. Billet VW/Audi 24V 2.8/3.2/3.6L Oil Filter Housing Caps ! Modular Billet Aluminum Oil Filter Housings For VW And Audi 24V 2.8/3.2/3.6L Engines ! This product is intended to replace VW/Audi Part Number 071-115-433 (071115433). Please check the OEM part number of your oil filter housing cap before ordering. You can do this easily by calling your dealer and giving them your VIN # and asking them to tell you the part number for your oil filter housing cap. Introducing the GruvenParts universal billet dipstick handle! We've teamed up with WhanAB to bring you this universal billet dipstick handle professionally CNC'd from aircraft grade aluminum. This handle allows you to retain the factory wire, stalk, and level indicator section while replacing all the visible orange plastic with a trick billet aluminum handle. This option is truly the best of both worlds – aftermarket looks using the OEM wire instead of a braided wire that could bend and provide inaccurate readings! Choose between a circular pull handle or square to suite your needs! Fits any rectangular steel wire dipstick. This can be modified to fit composite wires or other cross sections, but may require bonding of the billet handle. 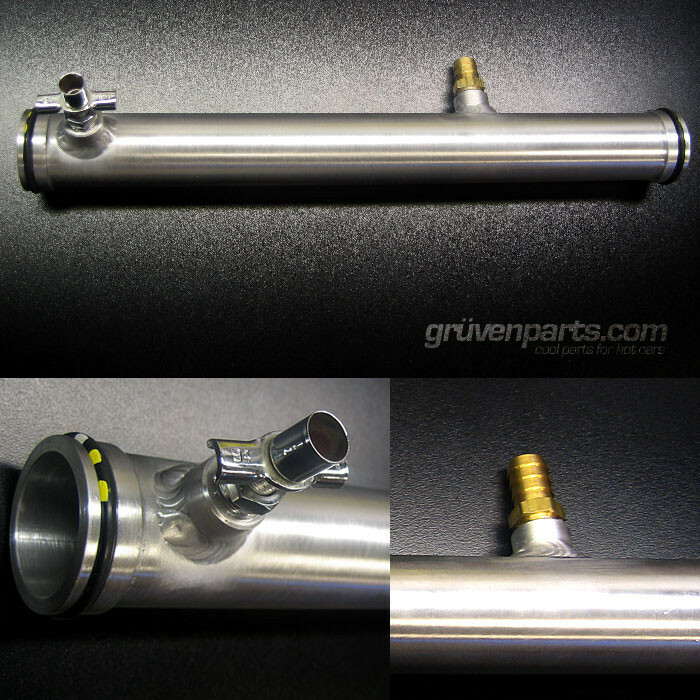 Click Here for the GruvenParts 1.8T Billet Dipstick Funnel Combo ! GruvenParts is proud to re-release these beautiful 1.8T dipstick handles with billet funnels. You can now choose from our high polished or as machined finish ! These parts are precision CNC'd from aerospace grade 6061-T651 aluminum right here in the good ole USA. Don't fall for a Chinese knock off, buy direct from the source. Our billet dipstick handle is available in traditional round or retro square designs and will take the place of your existing fugly orange dipstick handle while retaining the stamped steel rigid OEM dipstick wire. Braided wires just don't work as they bend in the tube and can provide incorrect oil level readings. Why not re-use your existing OEM wire AND get rid of the construction cone orange handle ? This is truly the best of both worlds. Please CLICK HERE for the DIY on how to easily install our billet dipstick handle onto your existing OEM dipstick. Choose from highly polished (shown on left) or as machined (shown on right) to suit your tastes. The highly polished version looks nearly chrome and will really set apart your vehicle at the shows (while never breaking again!). You could also anodize or paint these in whatever color you wish. Finally, a bulletproof replacement for the OEM plastic dipstick handle and funnel found on 1.8T VW and Audi! This version fits in place of OEM P/N 06A-103-663B (06A103663B) dipstick funnel found on 1.8T Audi TT, MKIV Golf, Jetta, and New Beetle. Please make sure to check your specific vehicle, as VW and Audi have both produced several plastic orange versions. Got another dipstick not shown on our product page ? Check out our universal billet dipstick handles ! Now you can easily convert almost any dipstick to a billet handle ! Quick Reply: :: GruvenParts.com Adjustable Control Arms, Billet Goodies, and More for Audi !